ESRA's mission is to provide foster care to English Springers impounded by humane societies, private shelters, and animal control facilities nationwide, as well as to offer adoption referral services for those agencies. In honor of Valentine’s Day, I have to write a love story. What can I say? I love a good love story, although this will not be the boy meets girl and falls in love type story. 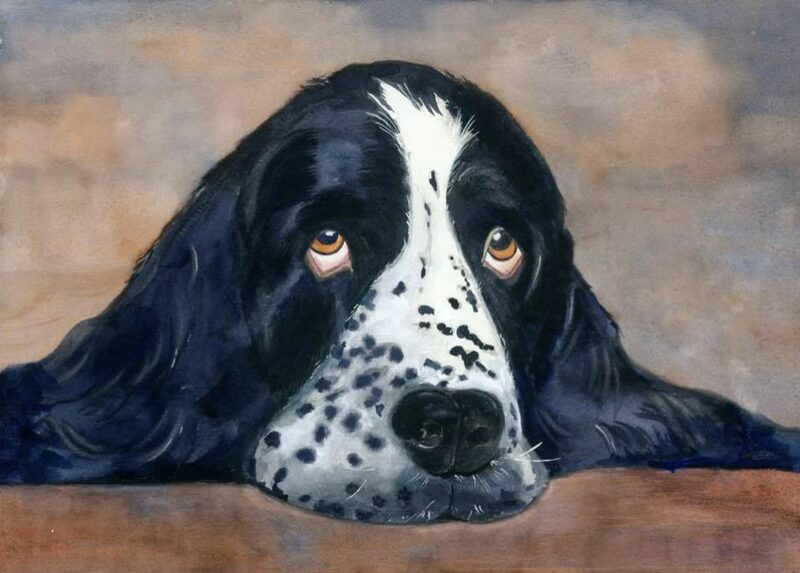 This story begins about 4 years ago when a small, adorable English Springer Spaniel came into my life named Lila. It was love at first sight but I had no idea how our lives would change. I only knew that she was beautiful, sweet and perfect and I couldn’t wait to bring her home. I’d say a pretty typical ESRA adoption story. She fit seamlessly into my and my existing Springer Linus’ life. Over time, her personality really began to show as she became more comfortable. She has such a gentle and maternal soul. She’s the Springer that takes care of Linus and I, including nightly cleanings after dinner. I must be really messy. Last Fall, during one of our daily walks, Lila began to show some weakness in her back legs, which is not normal for a 4 year old Springer. After several tests, Lila was diagnosed with an extremely rare form of Addison’s disease. Addison’s disease involves the body’s ability to manufacture hormones that regulate and control blood sugar levels and salt and water in the bloodstreams which maintain blood pressure, etc. The disease can be fatal if not diagnosed because many dogs go into crisis which requires emergency care. Thankfully Lila’s diagnosis occurred prior to a crisis but it was tricky because Lila’s form of Addison’s is not typical. The first test came back negative but she was continuing to decline daily. She would not eat and only wanted to lay in my lap. The vet and I decided to do a more extensive test at Michigan State University. The second test showed that her adrenal glands were normal but her cortisol hormone levels were very low. The diagnosis was secondary Addison’s disease. This means that her form of the disease was caused by the pituitary gland at the base of her brain rather than the adrenal glands near her kidneys. Basically the pituitary gland did not tell the adrenals glands to make the hormones her body needed. The most likely reason for this is a tiny tumor on the pituitary gland. Her form of Addison’s is extremely rare. Lila is the first case of secondary Addison’s disease that my vet has seen in over 20 years of practicing medicine. Michigan State would love for me to bring her up there so they could look at her. The treatment for Lila is a daily dose of prednisone which she will have to take for the rest of her life. This will replace the hormones that her body does not produce but will also destroy her healthy glands so that they will ultimately never be able to product the hormones. Lila has responded well to treatment but is not back to her normal energetic self. She’s gained quite a bit of weight and is losing hair. Back we go to the vet for more blood work to check her thyroid levels. All of Lila’s tests have to be performed at Michigan State now, which involves sending her blood samples overnight. The results of the thyroid test were similar to the previous tests. Her thyroid is normal, however her pituitary gland is not sending the signal to produce the needed thyroid hormones. The treatment for this is also to provide her with the hormones that her body is not producing. She’s still not back to her normal self, but we’re getting there. Her poor little body just needs some help and she can still develop other complications, so Lila will always need monitoring. Ok, how is this a love story? Sounds more like a medical drama I know. This is our journey. This is indeed our love story. This is the love story of rescue. When you rescue, you don’t know their past or anything about their parents or genetics. Sometimes you figure out things as you go along based on certain behaviors but most of the time, you really just don’t know their history. You only know that they’re with you and they depend on you and it’s your job to take care of them, especially when they weren’t take care of before. What Exactly Happens at a Springer National Specialty? A couple of weeks ago, the English Springer Spaniel Field Trial Association held their National Specialty event at Purina Farms just west of St. Louis, Missouri. If you’re like I was a few years ago, you might be asking yourself, what’s this all about? What goes on at these events? Does this have anything at all to do with rescued English Springer Spaniels? I had to see for myself. So, back in 2007 when I first heard about something called a National Specialty for Springer Spaniels, I decided to travel from Texas to Lexington, Kentucky to check it out. I was absolutely astounded by what I found. There were all kinds of events and I met some amazing people who ultimately led me to volunteering for ESRA. The next National Specialty was to be held in Dallas the following year. At that time, I lived in Dallas so I attended again and met local ESRA volunteers who were so fun and welcoming. I’ve been volunteering with ESRA ever since and have attended two more National Specialty events where I accompanied my rescued Springers Linus and Lila in the Parade of Rescues. What can you expect if you decide to attend a National Specialty for Springers? There are a number of competition events during the week, including Conformation (like you see on tv), Scent, Obedience, Agility and Rally trials. In addition to the competition events, there is the Parade of Rescues where rescued Springer Spaniels take a lap around the show ring with their owners while the audience listens to the story of their rescue. There is never a dry eye in the house during this event and it is a personal favorite of mine. It is truly a feeling of joy to walk your best buddy around that ring while everyone applauds and cheers. These rescued Springers are each so special and have amazing stories. It’s just a very emotional and beautiful experience to participate in or observe. The National Specialty is a great place to learn more about Springer Spaniels and what kinds of activities they can participate in. We had an adopter drive up from Arkansas this year for that very reason. In addition, two ESRA Springers passed all ten of the requirements to earn their Canine Good Citizen Certificates. The Canine Good Citizen Program is an AKC (American Kennel Club) two-part program that stresses responsible pet ownership for owners and basic good manners for dogs. You can’t have a party without some good food, so naturally ESRA volunteers find time to gather for dinner and camaraderie. There is also a silent auction full of beautiful specialty items for all budgets. Perhaps the best part of attending one of these Specialties is the special friendships that are formed and enhanced during this week of Springer togetherness. ESRA also has a fabulous booth manned by many volunteers and their ESRA representatives. So, if this article has intrigued you at all, the next English Springer Spaniel Field Trial Association National Specialty will be Saturday, October 5, 2019 through Saturday, October 12, 2019 in San Diego, California. I know it’s on my list to attend for some of the events. It’s not necessary to be there the whole week unless you’re participating in some of the competition events. Most of the rescue events take place over the weekend. There is also a website that will keep you up to date on all of the latest information. We hope to see you there for more Springer fun! What’s the Secret to a Great Picture of your English Springer Spaniel?